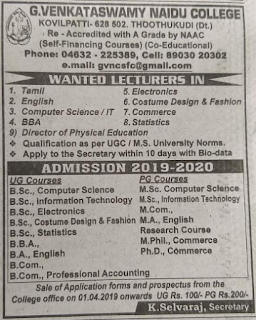 G.Venkataswamy Naidu College, Kovilpatti Notification 2019 GVN College Lecturer Jobs,Jobs in G.Venkataswamy Naidu College Recruitment 2019 for Lecturer,Lecturer/ Physical Education Director Jobs in G.Venkataswamy Naidu College. G.Venkataswamy Naidu College Lecturer/ Physical Education Director Jobs. For these jobs you can apply from within 10 days from the notification date. 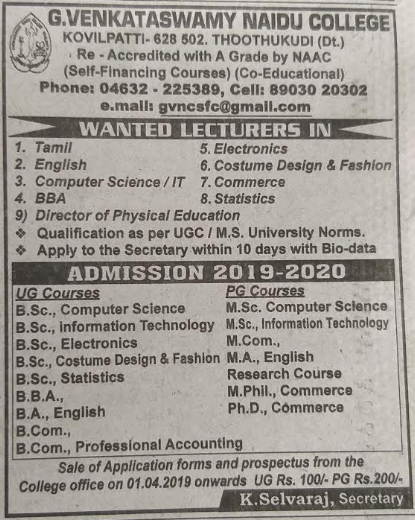 For more details refer the official website http://www.gvncollege.org/ for Lecturer/ Physical Education Director Jobs recruitment 2019. More details Like Selection Process, Important Dates, Qualification, Salary and e.t.c. Are available given below. Lecturer/ Physical Education Director Jobs in G.Venkataswamy Naidu College. Eligible candidates are requested to send the Bio-data to college Email Address is given below.